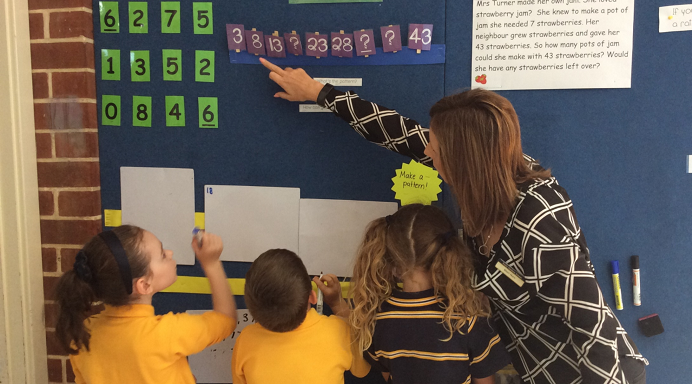 As numeracy is a site priority, intellectually stretching and supporting students at risk is a key action to improve student learning outcomes. At Trinity Gardens School we ensure teachers have relevant, up-to-date resources to engage, challenge and immerse students in numeracy. Staff regularly attend Professional Development and work with partnership schools to support staff in learning, design and moderation. Some strategies and programs utilised throughout the school include: Too Smart, iMaths, Sumdog IXL and Maths Mate. There is a role parents can play in supporting and encouraging maths at home. This would be to recognise situations around the home that involve maths and have your children help you solve them e.g. painting a room – how much paint will you need OR planning a party – how many sausages will you need if each person is particularly hungry and wants three? For other ideas please see the parent borrowing section in the library and seek out the Ann Baker parent handbook, this supports the learning of the strategies with easy to play games.